Most of us, the world over, now live in towns; 'town-thinking' has become consensual thinking and our dogs have become victims of that, just as we have. Town living have brought about dogs of high financial value but little functional worth. In times past dogs were valued for what they could do rather than how they looked. James Wentworth Day, the renowned sportsman and gifted writer, had very definite views on the betrayal of function in dogs. In his The Dog in Sport (Harrap, 1938), a wonderful read for any teenager interested in dogs, he wrote, on the subject of the Dachshund: "Born a fighter, bred a warrior, nurtured on Nordic aims of war, he has become a mere paddler about carpets, a licker-up of chocolates, a sycophant at women's knees. So the days of dogs decline." And on retrievers he wrote: "...I mourn for individuals among them. The show-bench and the drawing-room have made fools of them, undermined their character, ruined their stamina, set their nerves on edge, reduced them from working dogs to park paddlers, tea-table sycophants, and drawing-room druggets." He never minced his words! Town-living was behind the change. Dogs developed as functional creatures and those specialising in certain tasks over several hundred years merit our empathy. We seem to take more interest in coat colours and tail lengths than functional capability in dogs, and they deserve better. Dog show judges used to be mainly countrymen - often judging ponies too. I warm to show ring judges who still try to reward the working physique in their entry. But, some will cry, the breed standard will protect the functional anatomy. If only this were true. There are clearly breeders of sporting and working dogs who have no idea whatsoever of the build which allows their breed to function. If you have never seen a sporting breed operating in the country, what do you know? There is nothing new either in the public distaste for over-exaggerated harmfully-constructed dogs or in press criticism of show ring exhibits. What is new is the ability of the news media to reach into every home with revealing pictures, coupled with a revitalised if sometimes misguided interest in animal welfare. It would be foolish in my view to assume that the new wave of moral vanity in the name of animal welfare will not affect the pedigree-dog world one day soon. If the best-bred, soundest, fittest dogs in the country can be banned from engaging in their centuries old activities, what chance have the less-fit, often less well-bred dogs, have in engaging in their century-old show ring activity? The pedigree dog world is a very diverse one. There is a gulf between the working and the showing side in so many breeds. Just as most dog owners don't hunt, most dog owners don't show - so why should they care? Breeds go their separate ways too; why should the owner of a Pekingese care about the Dangerous Dogs Act? Why should the owner of a Staffie care about breeds accused of having undesirable and harmful exaggerations? Why should the powerful German Shepherd Dog clubs get in a lather about docking? Who in the world of pedigree dogs gives a damn about lurchers? Lurchers are essentially dogs for the countryman. When dogs were valued for what they could do rather than what they looked like, excessively long coats did not feature to the degree they do now. 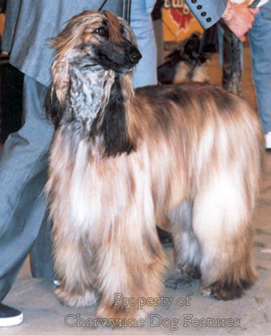 If you look at the early show specimens of Afghan Hounds and Soft-coated Wheaten Terriers, you will see jackets far shorter and less heavy than those on their counterparts today. 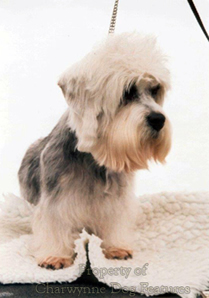 It is the same with many of the Terrier breeds:Yorkshire, Skye, Scottish, Sealyham, Dandie Dinmont and Kerry Blue especially. Once this strange obsessive lust for grooming rears its unwanted head, true type is soon replaced and then forgotten.The ultra-hirsute become the standard. The grooming addicts can then get to work but over the succeeding years so does public disinterest, unless their pet has cost them a small fortune at the grooming parlour! A long-coated dog in the country finds less favour. 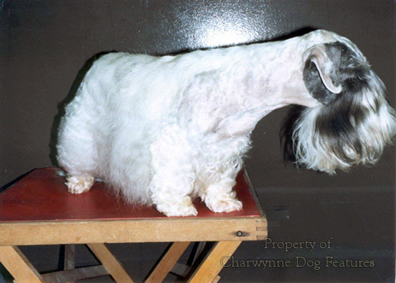 Length and texture in a purebred dog's coat are sadly now an essential element in the essential type of that breed. 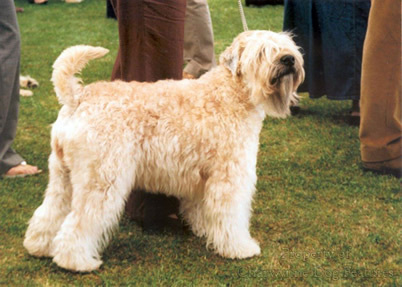 The comments of the judge in the Dandie Dinmont Terrier ring at a major 1996 Championship show made this point: "In my view there is no place for exaggerated top-knots, for long beards or for skirts and fringes under the body. While these things may all look flashy and may well make Dandies be noticed by those outside the breed, they do nothing to improve or even preserve true Dandie type." Could the pedigree Dandie live with ease in the country? 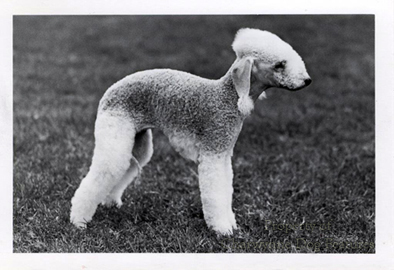 Another sporting terrier bred, the Bedlington Terrier, a unique combination of lurcher and terrier, has a fluffy coat in today's rings because the word 'linty' is interpreted as profusely fluffy instead of its real meaning, a weather-resistant 'mattress filler' of a coat. Will we soon need dogs for the town and dogs for the country?